The greeting is from Be Encouraged clear stamp set. Do you remember when we had to hand write letters? LOL! Back in the old days, I collected writing pads and the other day I happened to dig them out... and since I was looking for thin paper sheets, I decided to use some of that. 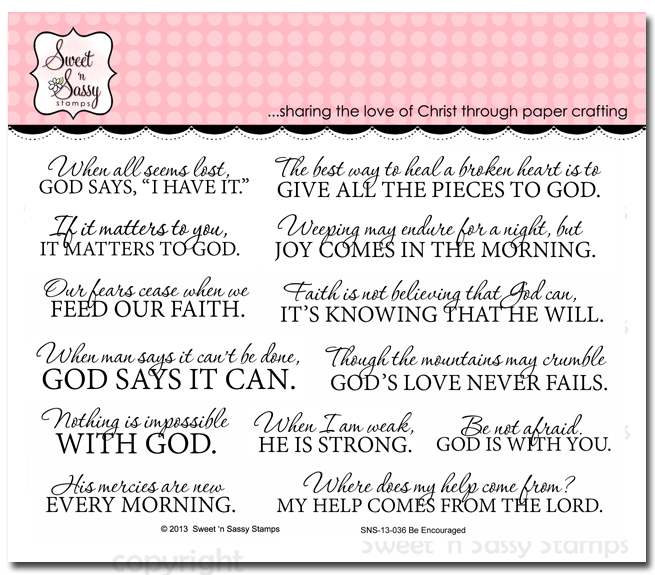 I used Creative Worship: Name Above All clear stamps set to decorate the cover of each of the signatures that made up the journal. 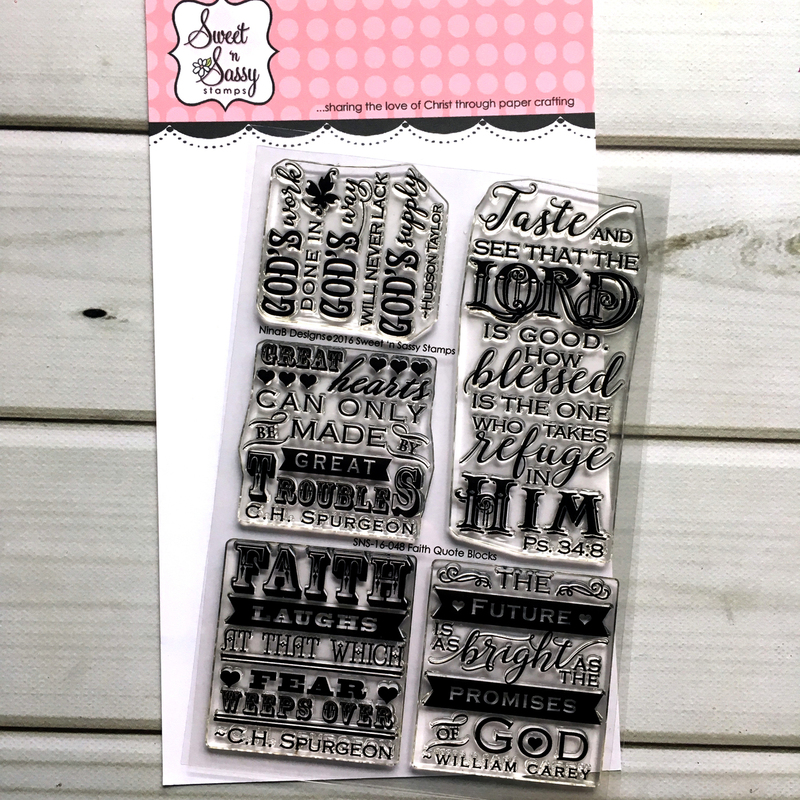 I also made a bookmark using Faith Quote Blocks clear stamp set. Decided to get the watercolors out today! I just find water coloring so relaxing! 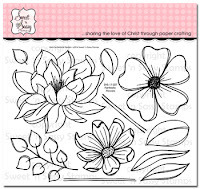 Today I am using Fantastic Flowers which is a new release and I have paired it with an older set, Be Encouraged. this is one of my favorite quotes and sometimes it is a hard on to grasp. We know he can but sometimes we wonder if he will, but...HE ALWAYS DOES! I stamped onto watercolor paper and used watercolor markers and a paintbrush, distressed the edges and added some pearls! 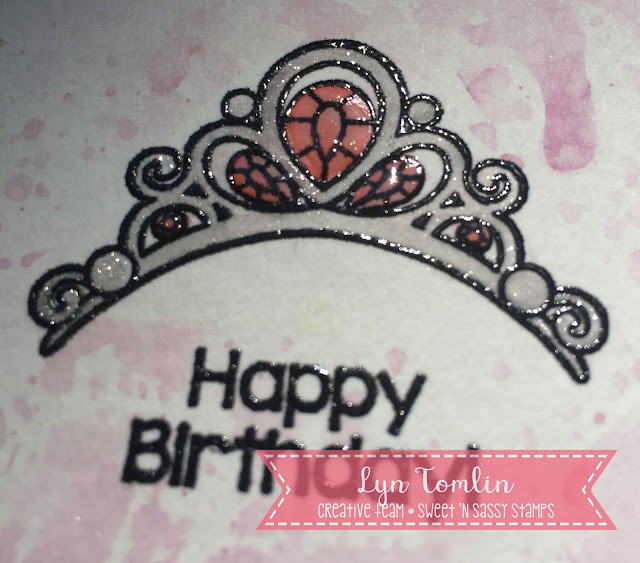 Today I have a very quick and sweet birthday card for a sweet little princess using Child of the King and Stand Tall Stamp Sets. I used Canson watercolor paper for the base and did some ink smooshing with Distress Inks (Victoria Velvet and Seedless Preserves.) 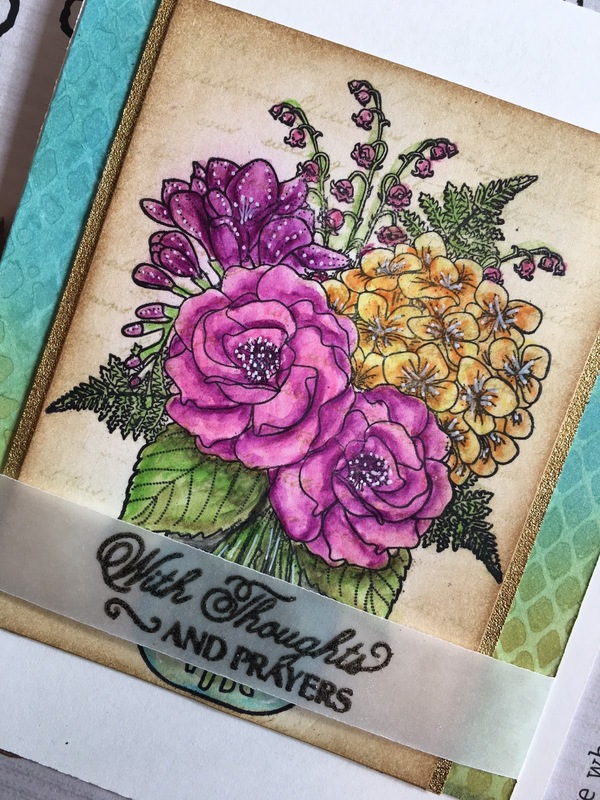 I inked the image and sentiment in Versa Fine Onyx Black and WOW clear embossing powder then colored the image with Zig Clean Color Brush Markers. 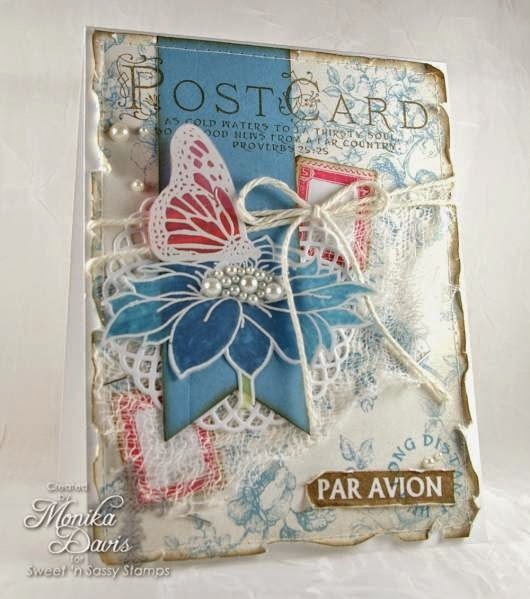 Wink of Stella, Glossy Accents, and rounded corners finished my card off. Hello, Sweet 'n Sassy friends! It's Ceal here to share a card with you today and I chose to work with the Fantastic Flowers and the Kindness Matters sets, these are two of the June releases and they are amazing! 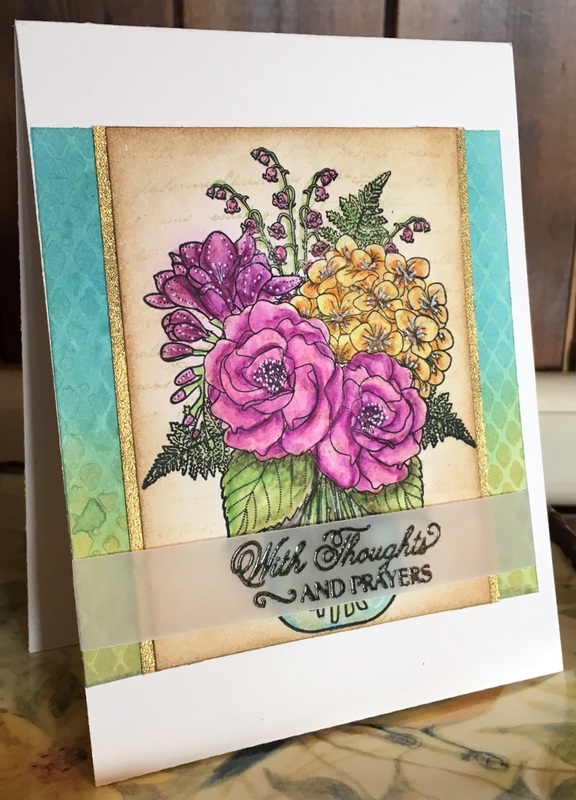 This card was super simple to make, using watercolor paper and archival ink, I randomly stamped the leaf image from the Fantastic Flowers set along the border of the card front and watercolored it with the Daniel Smith Pearlescent watercolors and then added a greeting from the Kindness Matters set. To finish the card I added it to a crumb Car card base. 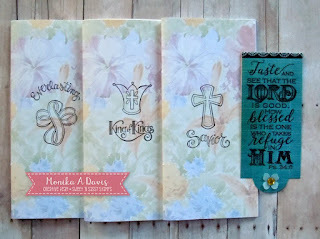 Today I am sharing two projects, a card and a bible journaling page, using the Fantastic Flowers stamp set. 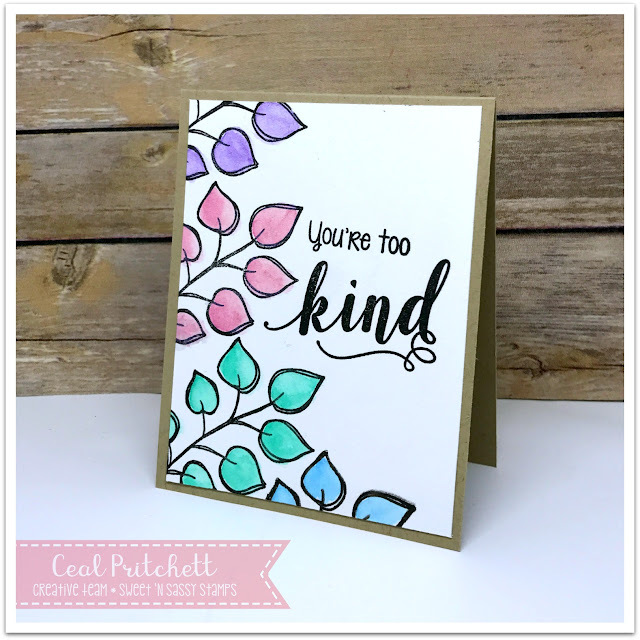 The card I made also uses Kindness Matters. 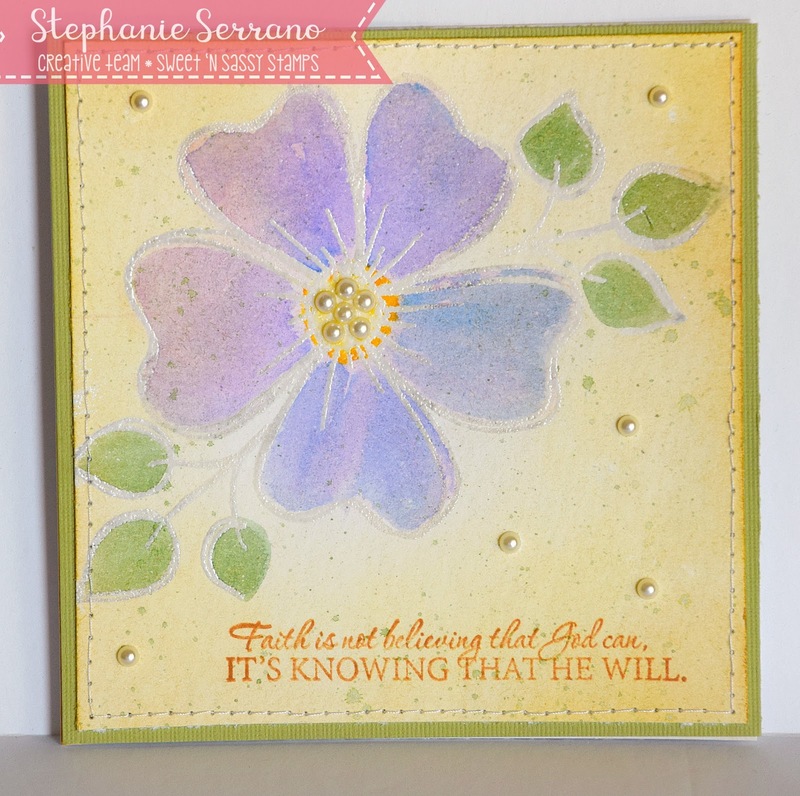 This card is simple but very striking with the flower layered onto the white panel. 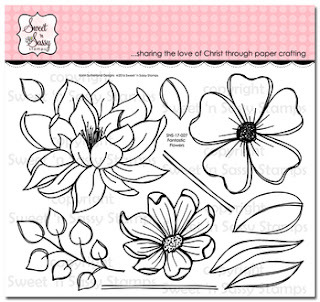 I simply sponged 3 colors of ink onto white cardstock and stamped the flower on top in black. After I cut the flower out, I hated to throw away the leftover sponged piece, so I stamped the leaves, cut it down to the size I needed, and used it for my background. I stamped the sentiment and added a few Nuvo drops to finish it off. 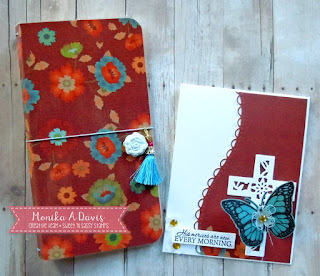 After my card was done, I loved the color combo and decided to re-create it in my bible. I chose Romans 8:37-39 to journal. The colors are a little more muted on the bible page but it still turned out fine. I masked the verse and purposely sponged the color lighter on the top left corner. 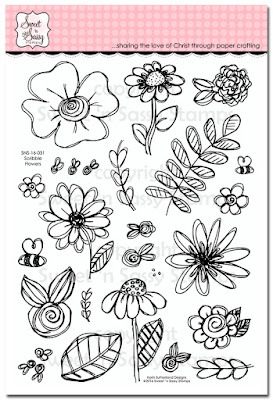 The same leaves and flower were stamped in black and highlighted a bit with a white pen. "Made for More" was stamped with the Love Ya Like A Sister Alpha. "Nothing can separate us..." was typed on my computer and cut out. Hello Everyone!! 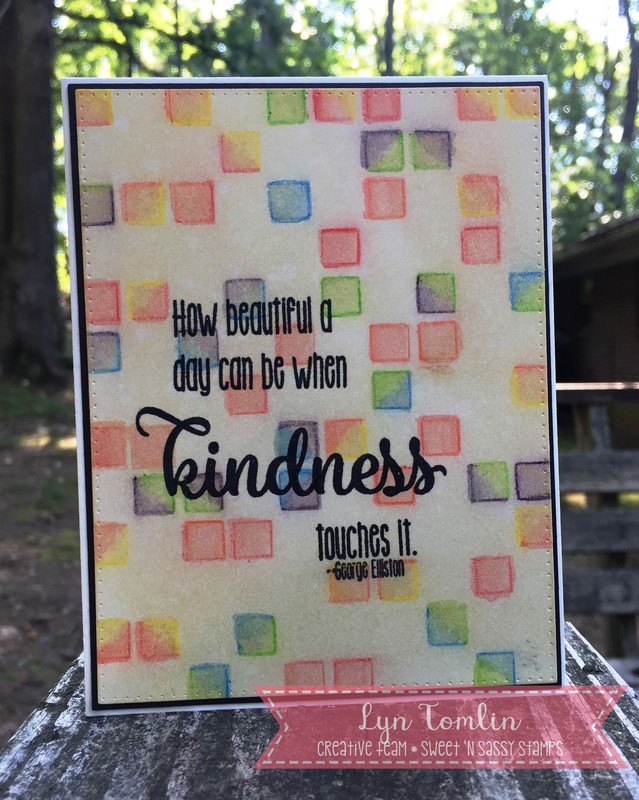 It's Sheri here with another card using the NEW Kindness Matters stamp set. I just love this set!! 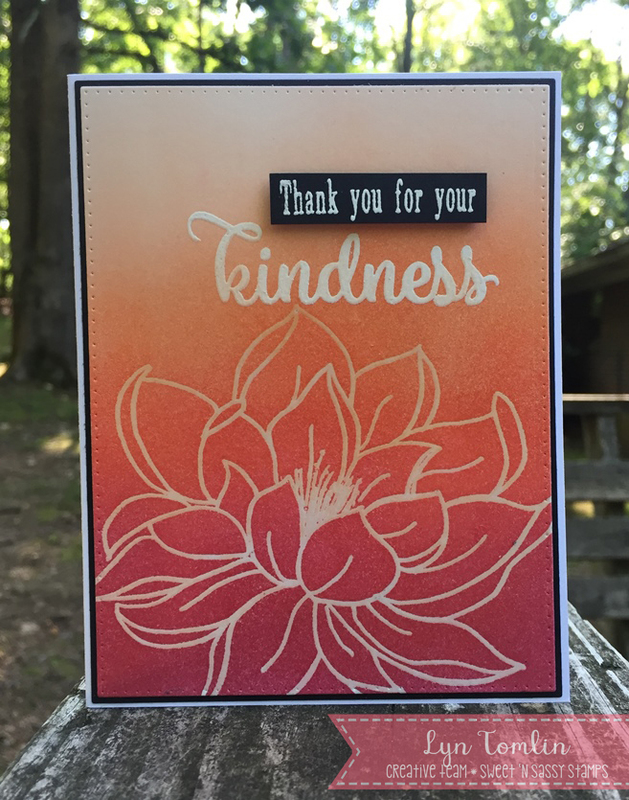 I created this card for a sweet friend that I wanted to show that I appreciated her KINDNESS!! Hello crafty friends! 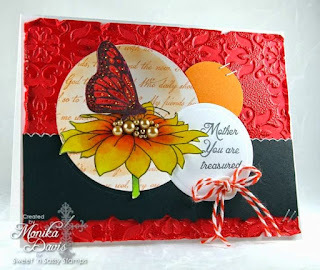 Kim here with you today sharing a card I created using the beautiful Mason Jar Bouquet stamp set. Isn't this image divine?! It's a great line image for coloring with you favorite coloring medium. My background started with Distress Inks and a stencil. I inked the background using a blending tool and Distress Inks, laid a stencil on top of the inked background, and spritzed the stencil with water. 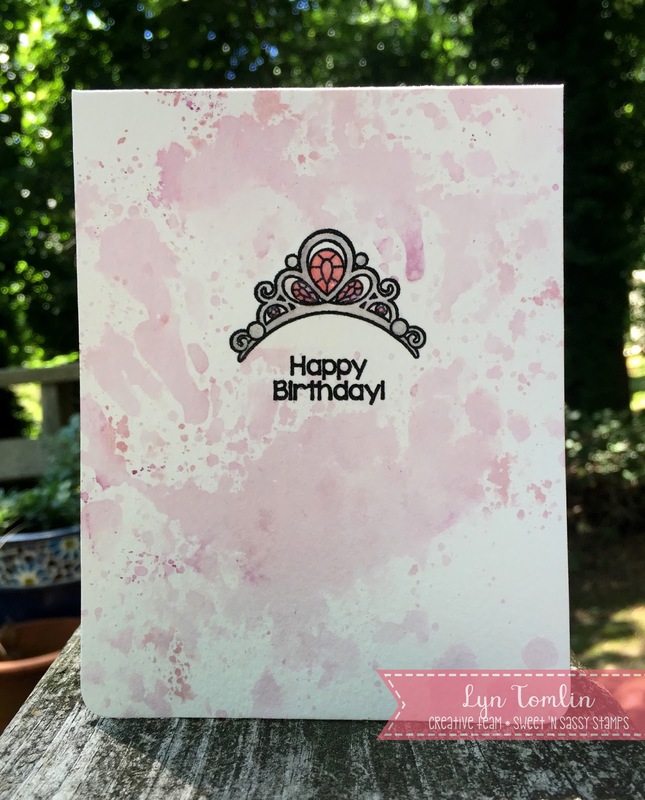 Because Distress Inks react with water, the stencil design appeared. You can use a heat tool to dry the paper. Next, I stamped the image on watercolor paper, using Archival Ink, and colored the flowers with more Distress Inks. 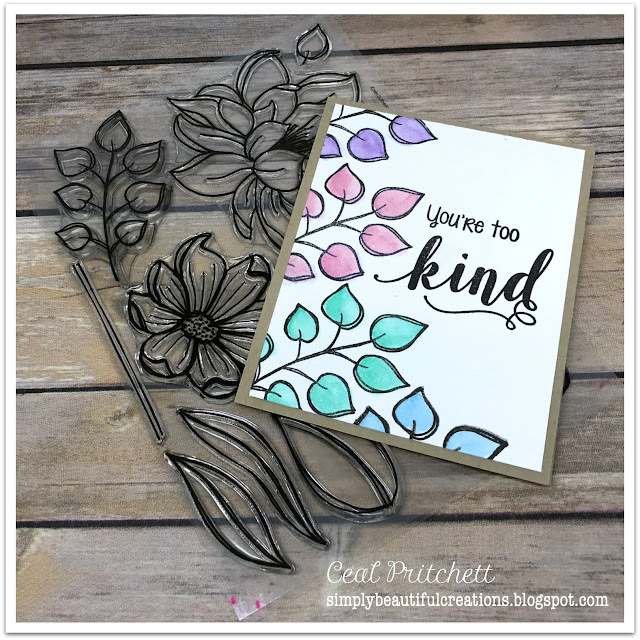 Just smoosh some of the ink onto a non-stick craft sheet or acrylic block and use a water brush to pick up and apply the color. After my coloring was complete, I used a script background stamp to very lightly stamp on the edges of the vase and flowers, and then aged the edges of the paper using more Distress Ink (Vintage Photo). I mounted my floral piece on to a piece of gold embossed paper (just emboss the edges of cardstock since the middle won't be seen), and finished with a black embossed sentiment, which was stamped on vellum. I hope you enjoyed today's card! Happy Crafting! Hi! 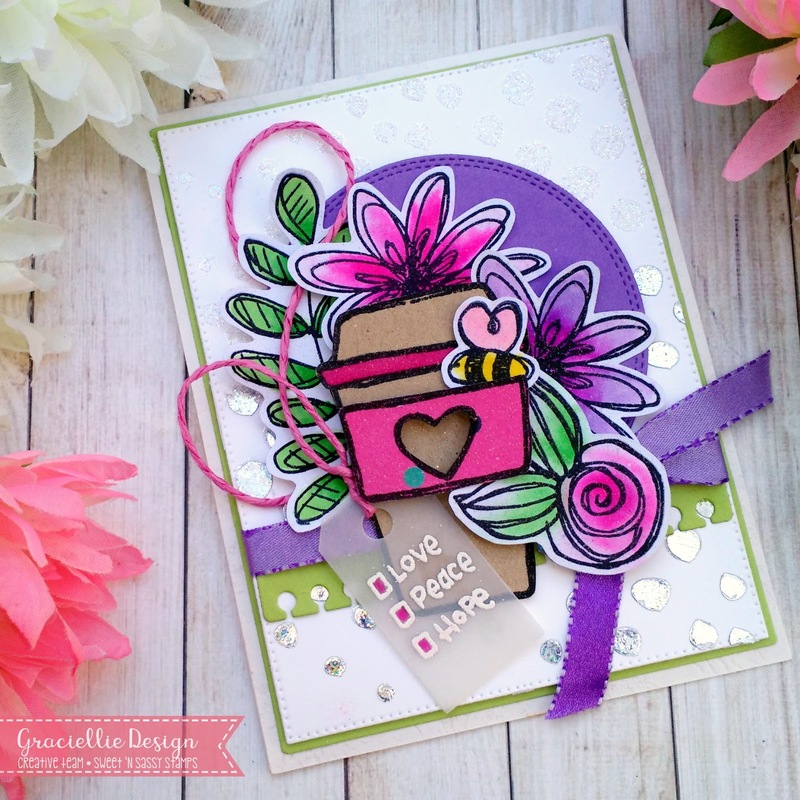 It's Gracie Chavez from Graciellie Design and today I have a fun freestyle collage card using stamps from Fill Me Up and Scribble Flowers! 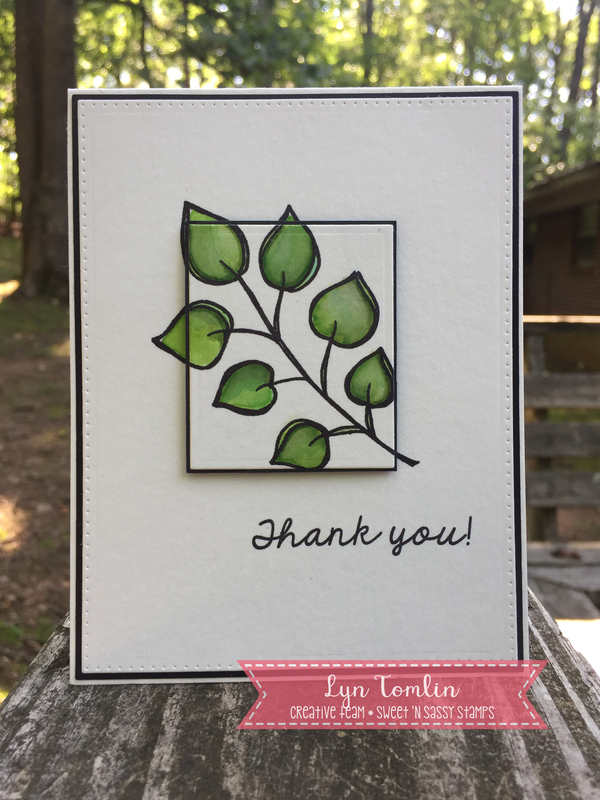 To make this card I went ahead and stamped as many scraps of white cardstock I could with flowers and leaves from the set Scrible Flowers with Black Premium Dye Ink. 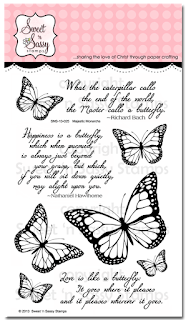 This particular ink I used is hybrid and it allows you to watercolor the stamped images. I colored them with Zig Markers and a waterbrush using bright colors. Once all the images were colored I fussy cut them and set them aside. I then stamped the coffee cup from Fill me Up on kraft cardstock and the heart coffee cup sleeve on patterned paper using the same black ink, and fussy cut those too. The final element I stamped was the mini label with little check box words from the same set and heat embossed them in white. Putting all the pieces together is always fun, but it can take time since there are so many ways to arrange them. The background is actually stenciled with Mixed Media Medium and half of it is foiled in SIlver Sequins and another part has Winter Frost glitter. I added a Wild Orchid Double Stitch Design small circle die cut on the back to make all the element pop. 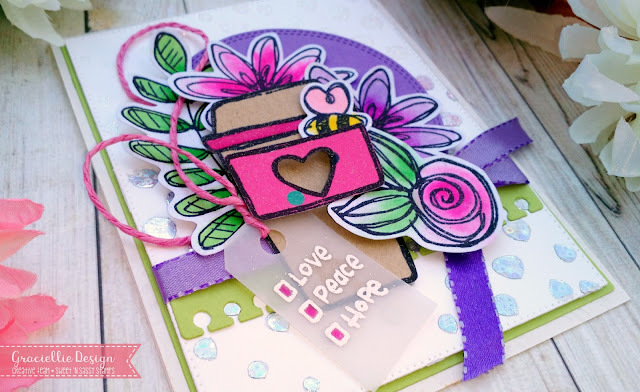 I finished off the card with some pink paper twine, a green notebook page edge die cut and 3/8 Reversible Satin Ribbon w/stitches which brings together all the design. That's it for today! For more ideas an inspiration make sure to subscribe to this blog! Thanks so much for stopping by! Hello, sweet friends! Hope your weekend has gotten off to a great start. I have several cards to share with you today using some of the new June Release by SNSS. One of the large flowers from the Fantastic Flowers set was stamped on a panel and three concentric circles were cut from it. Two of the circles were colored and the pieces were put back together. The sentiment was made with the new Grunge Type Alpha. 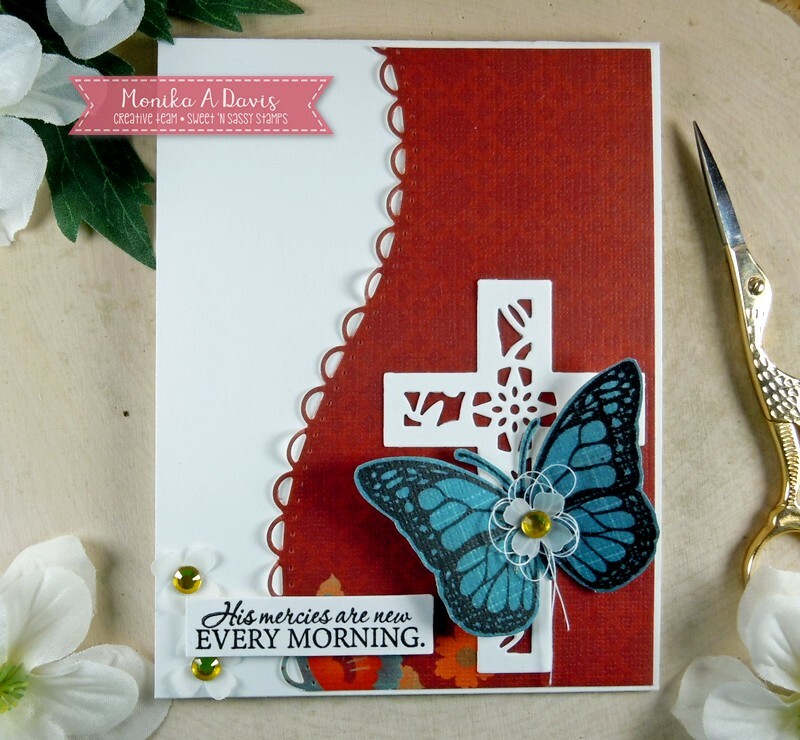 The inspiration for this card came from Freshly Made Sketches #292. 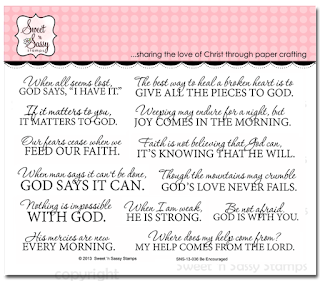 Another new stamp set released this month by Sweet 'n Sassy Stamps is Child of the King designed by Krista Hamrick. The jewels were white embossed on the background and watered down distress and oxide inks were dabbed over the panel. The King's robe and crown were colored with Copic Markers and the sentiment was white embossed on the angled magenta panel. A few sparkly gems fit for a king were added to finish the card. 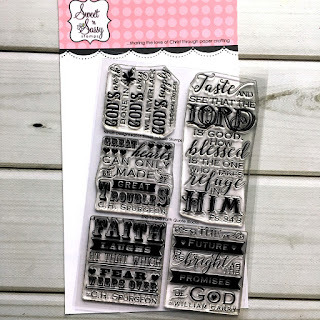 Sweet 'n Sassy Stamps Store! 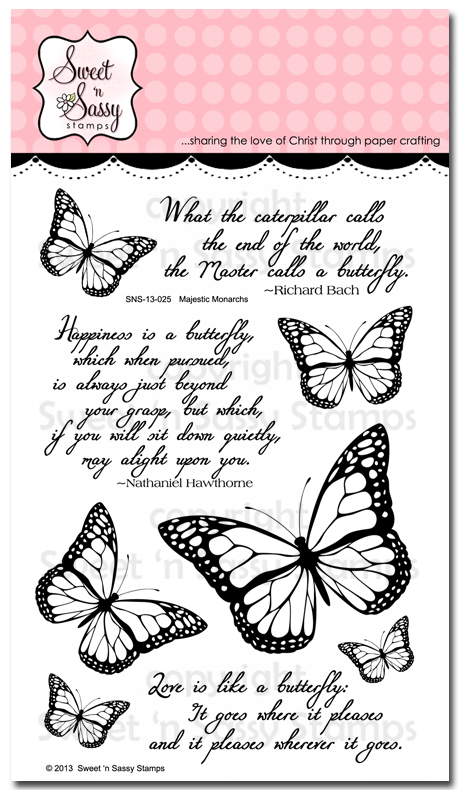 Everything on the site, including these fabulous new stamps, is 25% off...no coupon code is needed! Happy shopping and happy stamping...until next time! Hello! It's Monika here today, bringing you a card using Treasured clear stamp set. It's one of those sets that I used to love, but put aside in favor of new sets... but this year my goal is to rediscover old favorites and give them some love. If you are like me, you have so many stamp sets, you can't even count them... as much as it's fun getting the new sets, we end up with not getting enough use out of our old sets. So let's pull those 'old' sets out and give them some LOVE! 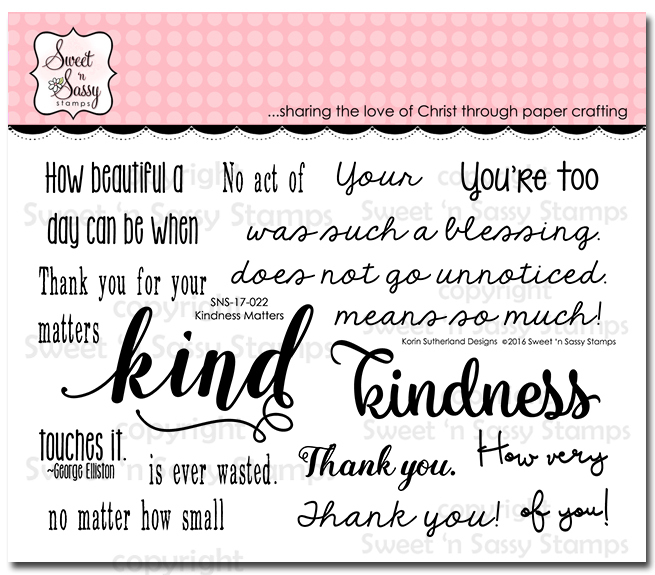 I also used another favorite of mine, Be Encouraged clear stamp set. It's a great companion set with powerful greetings. Focus on the good.....such a simple message, yet so easy to overlook! There's some big stuff going down in my world right now. If I'm not careful, I can make myself a little Satan target. He just lies in wait for me to start doubting, to be sad, to get negative.....and, BAM!! In the pit I go. The good news is........there is Good News!! Focus on the good! I absolutely adore Rebecca Rios' designs. 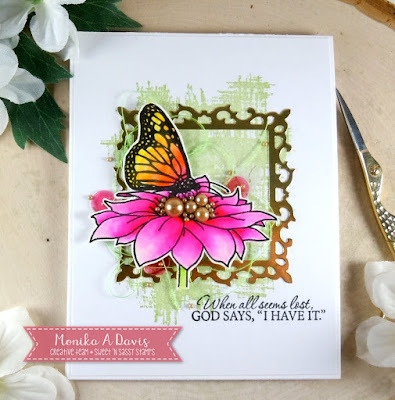 Just from her stamp sets alone, I imagine her to be one of my best friends, full of positive light and an awesome sense of humor and fun! 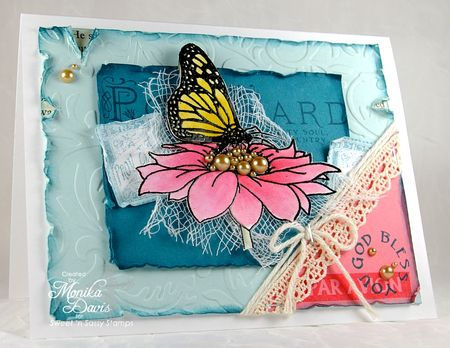 I used her set called Capture This Moment for this quick and fun card. I might be stuck in a water coloring rut, but its a good place to be stuck! 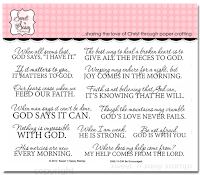 I hope you enjoy this fun card and reminder to focus on the good....you may have to look harder at times, but I guarrantee it---it is there!!! I am loving the great new stamps sets SNSS has this month and today's cards use a couple of them - Kindness Matters and Fantastic Flowers. 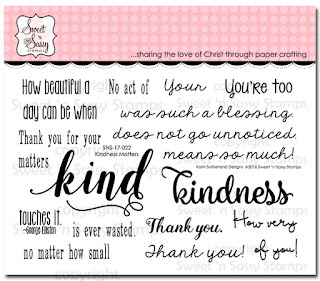 The sentiments in the Kindness Matters set are fantastic! They can be used on a variety of cards and the Flowers really are Fantastic - they are pretty big, but they are great and there are several to choose from including leaves. 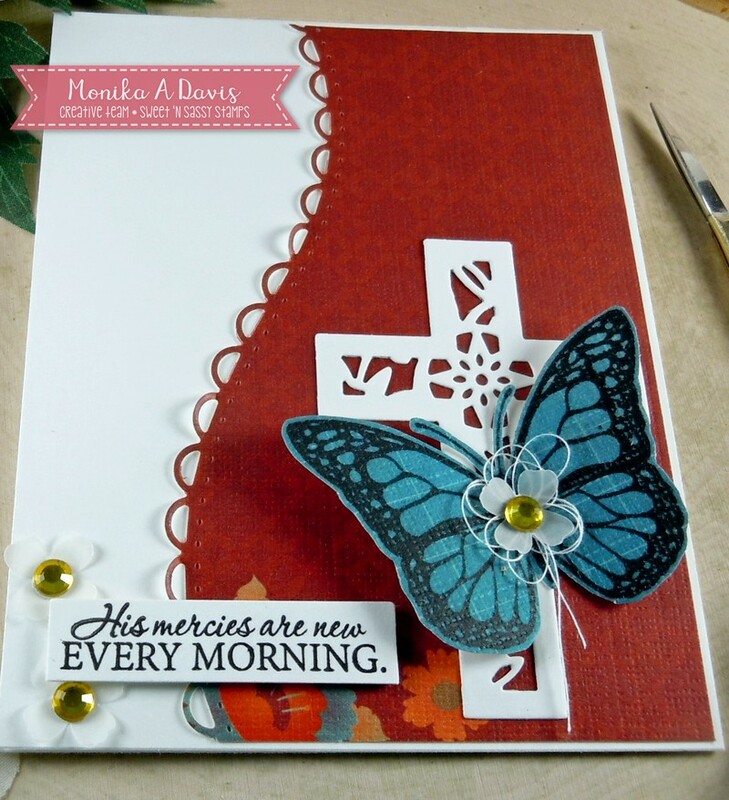 For my first card, I played around with emboss resist and ink blending. For the second one, I went pretty simple using the twig of leaves and water color (with Distress Inks). I colored it up twice, then created a 3D effect then added the "Thank you!" 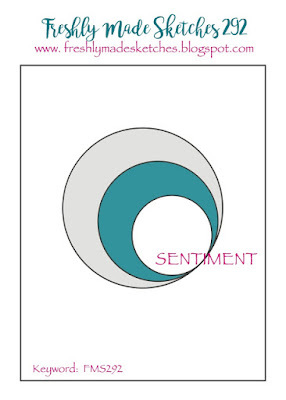 sentiment and that is all there is it. For some reason, this one really makes me happy. Finally, I got out my Inktense pencils and a Grid stencil and created a background for the bigger sentiment. The background was a little bight so I went over it with Antique Linen Distress Ink. This is really exciting - Now I have a thank you cards for my stash which is something I don't really think about too often so... yay!! I hope today's cards provide you with a little inspiration! Thanks for stopping by and have a great day! Check out our Creative Worship Blog! 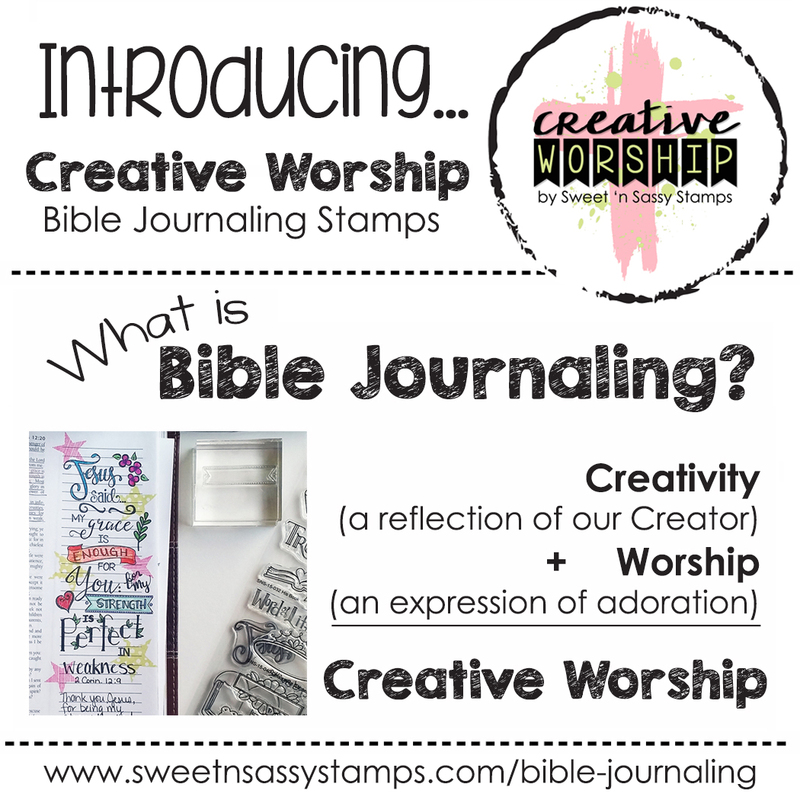 For all things Bible Journaling with Creative Worship stamps. 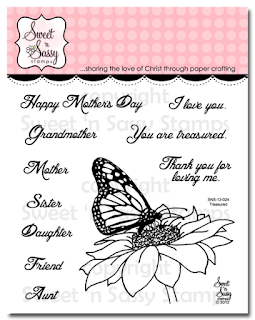 Visit SweetnSassyStamps's profile on Pinterest. SNSS Happy Easter! Coasters and Card!